Fixed a bug with using “getByTitle” and not the correct “getByName” in the SP 2010 code example. 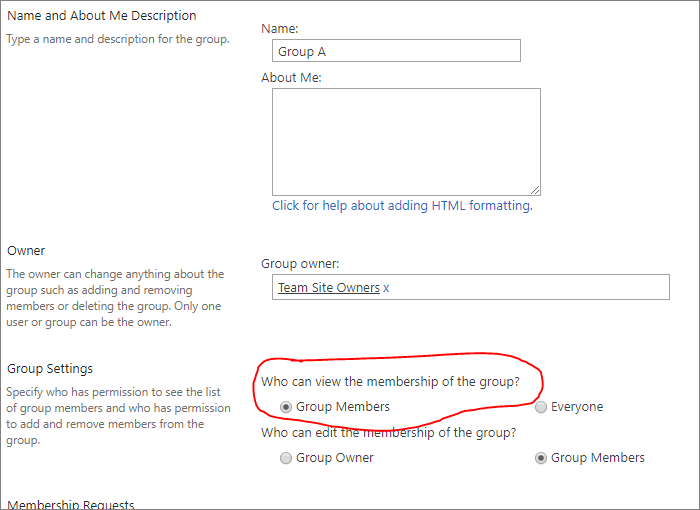 This is a workaround for verifying membership in a SharePoint group when the user is added to the group as a member in an AD-group, and not as an individual user. You find two code examples below. The first one will work in SP 2013 only, but the last will work in both SP 2010 and SP 2013 (not SP 2007). Disclaimer: I have NOT been able to test this as I don’t have any AD groups to add in my SP 2013 Office 365 test site. The number 18 in the function “checkADGroupMembership” is the SharePoint group id, but you can also use the display name of the group – change it to match your group. This rule is set up with the trigger “No trigger (must be triggered manually), and with all the actions you want to apply if the rule is triggered. To trigger the REST call / JSOM query, and the following trigger of the DFFS rule if the user is member of the group is done by another DFFS rule triggering on “The form is ready”. Set this one up with the function name “checkADGroupMembership” in the “Run these functions / trigger these rules” field. If the logged in user is member of the SharePoint group as a member in an AD-group, the rule “isInADGroup” will be triggered. I hope this makes sense, and if not – post a comment below or in the forum. I have updated this post with a code example that will work with SharePoint 2010. How would I modify your code to do the inverse of this? btw, you should specify in the documentation the number 18 is the id of the SharePoint group and not the AD group. The first function is for “success = is in group”, the last function is for “fail = not in group”. I’m using 2013, that cc.executeQueryAsync function does not exist in the code for 2013. Just add an “else” here, and you should have the “not in group”.